Nobody questions that the look of your superhero disguise is as important as your super powers, especially for you speedsters who need to make sure that your blur doesn’t run colors together and just make you seem like a brown streak Blech! (Well, there are a few who believe you can run around with amazing powers and not dress in an elaborate costume, but those are usually the mid-range heroes with powers like “identify that weird smell in the bathroom” and “don’t get wet when it is just sprinkling a little bit.” Don’t get us wrong… those are all pretty impressive, but the ones saving the world know that costuming is key. So, since we all agree, let’s take time to note that the spandex shorts and flowing cape aren’t enough, folks! You’ve got to have a costume from head to toe and, today, we’re going to focus on the toes. Your costume is near perfect, but you need a little bit of that dazzle for your superfeet. 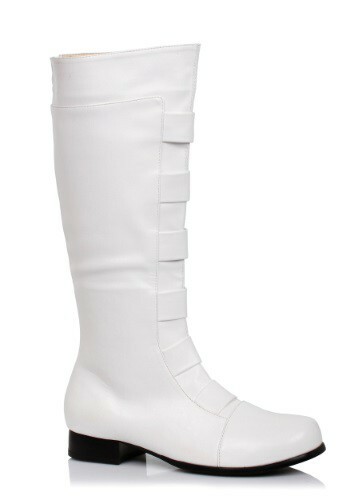 Do so with these Adult White Superhero Boots. Finish up a perfect Diamond Queen, Storm, or even the particularly successful Stormtrooper with this crisp white short 1” heeled boot with decorative straps in front and an easy zipper in the back. Conquer those baddies and look truly super while doing it!